The declaration by President Ferdinand Marcos of Martial Law in the Philippines on September 21, 1972 is a social phenomena. The debate over his role and how society should judge the Marcoses who are still in power was renewed recently. Some say that the country was better off under Marcos. They say we need need an iron fist for the Philippines to progress. Others believe that those who have not experienced or seen the horrors of Martial Law are the only ones who would favor it. 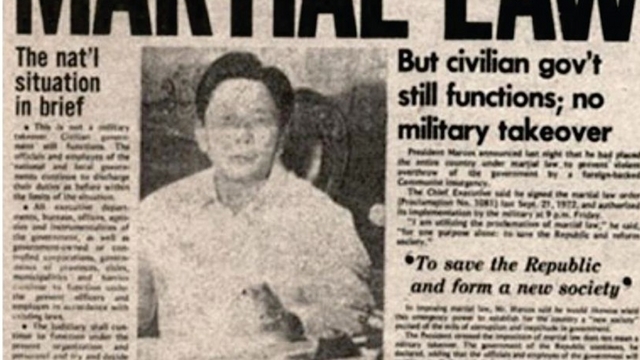 Some say, however, that the lack of understanding about Martial Law, especially those belonging to the young generation, is because the nation lack of a sense of history, a collective memory. Not much sense is made of the past, the horrors, sufferings, and hardships under Martial Law. The most prominent victim of Martial Law was then Senator Benigno Aquino, Jr., an opposition solon who was imprisoned by Marcos. He was placed in solitary confinement for more than seven years, suffered a heart attack, and was sent to the United States for treatment. He returned August 21, 1983 and was gunned down on the tarmac of what was then the Manila International Airport that was renamed in his honor several years after his wife, Corazon Aquino, assumed the presidency through a military-backed people’s uprising in February 1986. It was not only Aquino who suffered under the dictatorship. At least 9,000 more were imprisoned, tortured, and killed during what is now being called as the darkest days in Philippine history based on the records that TFD holds it in its files. This is the collective memory that the Task Force Detainees want Filipinos to have to point the nation in the right direction. This video short by PCIJ deputy producer Cong Corrales tells us about this museum as the death anniversary of Ninoy Aquino nears.